Plasmid DNA Mini Preparation provides a simple, fast and cost-effective method to purify plasmid DNA without phenol/ chloroform extraction. It is based on binding of DNA to silica-based membranes in a chaotropic salt. An average yield of 1-10 ug plasmid DNA can be expected from 1-3 ml overnight bacterial culture. RNA Extraction System provides an method to purify total RNA from various samples such as cultured cells, tissues, bacteria, and yeast. A simple silica-membrane spin-column method can isolate total RNA without phenol/ chloroform extraction and ethanol precipitation. Total RNA with a molecular size greater than 200 nucleotides . 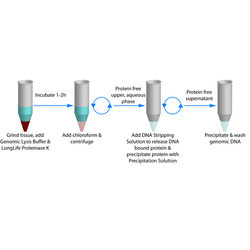 Quick one step method enables rapid isolation of Genomic DNA from Bacteria . This kit is used for rapid isolation of genomic DNA from fresh and frozen blood sample. DNA Extraction Kit provides all the reagents necessary to recover PCR ready DNA from a variety of environmental samples. The kit utilizes a hot detergent lysis process. Bacterial protein extraction kit is designed for the lysis of bacterial cells for the purification of recombinant type proteins. It is useful for the preparation of high inclusion bodies. This method does not require special equipment’s such as sonicater or French press. The kit is designed for fast extraction and purification of DNA from tissue sample. The kit is provided with spin column can bind up to 10μg of puried DNA. Minimum quantity of hair sample is enough to perform the extraction. The kit is designed for fast extraction and purification of DNA from hair sample. 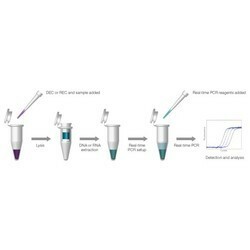 The kit is provided with spin column can bind up to 10μg of purified DNA. Other impurities like proteins,salts can not bind to the column. It is a proprietary detergent solution designed for efficient whole-cell protein extraction from cultured mammalian cells. It enables efficient and rapid cell lysis and solubilization of proteins for both suspension and adherent cells. Lysates can be used in many downstream applications. The purification method used in these protocols does not require use of phenol, chloroform,or CsCl. The DNA is purified without an additional step of ethanol precipitation. The kit is designed for fast extraction and purification of DNA from bone. The spin column provided have the ability to bind up to 5-10μg of DNA only. The kit is designed for fast extraction and purification of DNA from tissue sample. The kit is provided with spin column can bind up to 10μg of purified DNA. Other impurities like proteins,salts can not bind to the column. The kit is designed for fast extraction and purification of DNA from plant tissue sample. The kit is provided with spin column can bind up to 10μg of purified DNA. Other impurities like proteins,salts can not bind to the column. Homogenised plant tissue is suspended in genomic DNA extraction buffer containing CTAB. Cells are lysed by osmotic shock and cell debris is precipitated and removed by using phenol chloroform and followed by ethanol precipitation of DNA. Cell lysis solutions are detergent-based, buffers and reagent sets that have been optimized for particular cell lysis applications. Effective cell lysis and protein extraction for different species of organisms and different cell and tissue types require different buffer formulations. This kit is designed for quick one step method for DNA extraction from plant leaf. This isolated DNA can be directly used to perform PCR. Genomic DNA Extraction Kit (for Bacteria) is spin type product to extract almost all of Gram (-)/( ) Bacteria. Simple & Fast: It takes only 30 ~ 40 minutes to extract genomic DNA Spin Column type: Extract genomic DNA without organic extraction or ethanol precipitation. High purity & yield of genomic DNA can be up to 10µg. This kit contain SSCS solution, enables research to prepare competent E.coli cells in a single step and to transform cells with out heat-shock treatment. mRNA Isolation Kit is designed to isolate intact poly(A) RNA from cells and tissue without requiring phenol or other organic solvents. the kit contain guanidine-thiocyanate based buffers for efficient cell and tissue lysis,protein denaturation and Rnase inactivation to keep the mRNAintact. The technology is based on the coupling of Oligo d(T)25 to 1 m paramagnetic beads which is then used as the solid support for the direct binding of poly(A) RNA. The kit used for fast extraction and purification of genomic DNA from clinical samples such as fresh or frozen whole blood,serum and other body fluids. 300µl of sample per spin column is enough to obtain up to 10µg of pure genomic DNA. fication of DNA from Nail sample. The kit is provided with spin column can bind up to 10ed DNA. Total RNA Extraction (Trizol)is ready to usereagent for the isolation of total RNA from cells and tissues. Looking for BIO TECH KITS ?